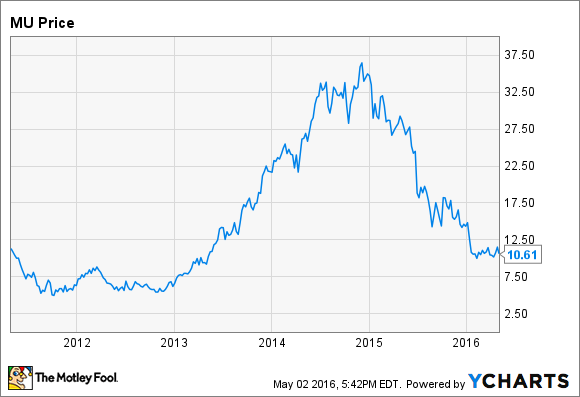 Why Analysts Disagree About Micron Technology Inc. There's a schism between those who believe that the industry has fundamentally changed, and those who don't. Among analysts, there's isn't much agreement when it comes to Micron Technology (NASDAQ:MU). The memory-chip manufacturer has seen its revenue tumble and its profits disappear as oversupply in the DRAM and NAND markets drove per-bit prices down. The stock has slumped along with the company's results, losing nearly two-thirds of its value over the past year, and wiping out much of the gains investors enjoyed in 2013 and 2014. Analyst price targets for Micron stock range from as low as $8 to as high as $20, a spread that's wider than the current stock price of about $10.50. Why is there so much disagreement? A couple of recent upgrades for Micron came from Raymond James and Brean Capital, along with price targets of $17 and $14, respectively. On the other side, Nomura and Susquehanna downgraded Micron in March. Nomura dropped its price target to just $8 per share, while Susquehanna dropped its target to $10. Despite the wide gap in price targets, there's really only one difference between the bullish analysts and the bearish analysts. The bullish analysts believe that the DRAM industry has fundamentally changed because of consolidation. There are now only three major DRAM manufacturers, and the idea is that these companies will attempt to maximize profits instead of gunning for market share. Supply-driven cycles may still occur, but they won't be as severe compared to the past. Micron posted a $1 billion net loss in fiscal 2012, with prices dragged down by oversupply. This situation eventually corrected itself, and in fiscal 2014 Micron earned a whopping $3 billion in net profit. The stock soared, trading at a price-to-book ratio of about 3.5, a level not seen since the aftermath of the dot-com bubble. Investors were betting that the good times would never end. But even with only three competitors, high margins didn't last. Micron's profits eventually began to tumble, and during the latest quarter, the company posted a net loss once again. The bearish analysts believe that nothing has really changed in the industry, and Micron's posting a loss seems to bear that out, at least to a degree. Samsung (NASDAQOTH:SSNLF), one of the major DRAM manufacturers, never got the memo about maximizing profits. The company has been aggressively going after market share, so much so that Bernstein analyst Mark Newman, once extremely bullish on the stock, proclaimed that Samsung has ruined for the industry what could have been a period of record profits. Bernstein had a mesmerizing $45 price target on the stock as recently as June 2015. The firm has since lowered that target multiple times to just $10 per share. Micron isn't cutting its production either, despite rapidly falling prices. During the company's conference call, when asked whether it was planning on cutting output, CEO Mark Durcan responded: "Well, first of all, we're not going to do it unless we see negative cash margins, because we haven't added any incremental capacity. And we think we'd be foolish to be the first ones to take capacity off, given that fact set." Combine Samsung's aggressiveness, Micron's unwillingness to cut production, continued weak demand for PCs, and the first quarterly decline in global smartphone shipments, and you have the makings of a deep slump in the memory-chip market. The bullish analysts still believe that the effects of consolidation will ultimately win out, but nearly everything is pointing in the opposite direction. So far, I don't see any evidence at all that the industry has fundamentally changed.